Ankle-Wrist IronsTM 2.5 pound each Ankle or Wrist Weights Ankle-Wrist IronsTM consist of a single thin layer of IRONWEAR TM's patented Flex-metalTM which wraps around the wrist or ankle. This unique weight conforms to your body to maintain uniform fit with no pressure points. 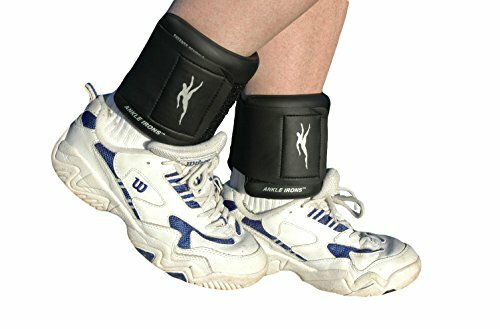 Ankle-Wrist IronsTM have a large over sized neoprene strap which adjusts the weight to the desired tension on any size ankle or medium to large size wrist. The design creates a comfortable fit with no movement or rotation. Ankle-Wrist IronsTM flex and move with you. They do not shake, sag or leak like weights filled with sand or metal shot. They do not bruise of chafe like weights made with metal bars. The weights are like padding and act like protection in case of a fall. Ankle-Wrist IronsTM are thin and can be worn under sweat shirts or pants. They are easy to wash and should last for years. Ankle-Wrist IronsTM Champion Series are encased in an abrasion resistant padded nylon fabric for maximum durability.